Euromillions is a lottery founded in 2004 played across nine European countries. You can win in one of 13 prize levels. The guaranteed minimum for the jackpot is EUR 15 million. The record-breaking winning prize in Euromillions was drawn in 2012. The winner cashed EUR 190 million. When you buy at least one Euromillions line you will be automatically included in an add-on feature called Millionaire Maker, extending your chances to win one million British pounds. Sometimes you can find out Euromillions as Euro lottery. Below you can find all information about this lottery. You will pick 7 numbers, 5 from the main line from 1 to 50. The remaining 2 numbers, called Lucky star, must be picked from 1 to 12. Alternatively, you can choose to play what is called Lucky dip, in which all seven numbers are randomly generated. Next, you will choose the day of draw and the number of weeks. Your participation in Millionaire maker will be automatic after buying at least one line of the main game. Tickets are drawn each Tuesday and Friday at 9 pm (CEST). Online ticket closing time always one and half an hour before the draw. You can note into you calendar all fridays as Euromillion friday. As to Euromillions played over the internet, the closing time is displayed at the website of each online lottery retailer. One line of Euromillions costs $2.5. The add-on (supplementary) game is free for everyone who buys at least one line of the main game. Millionaire maker is an add-on feature to the UK version of Euromillions. Each draw guarantees one winner bringing home the prize of one million British pounds. At the end of the main game drawing, a certified system will randomly select two special codes made up of four letters and five digits. This code is displayed at the bottom of your ticket. You get one special Millionaire Maker code (1 line = 1 code). The actual add-on feature is free; all what you must do is play at least one line of the main game. The Euro-version of Euromillions prize breakdown enables 13 prize levels. Two matched numbers are enough to win. The maximum jackpot is set at euro 190 million (£142 million), while the guaranteed minimum is euro 17 million. The maximum jackpot was first won by Adrian and Gillian Bayford in 2012. 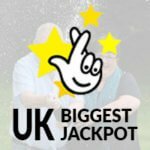 We wrote a special article about 5 of the biggest UK Euromillions winners. From time to time, Euromillions organizers announce a special draw called super-draw. The draws are held three times a year but this is not a rule. 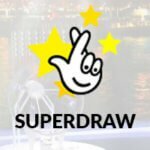 Each super-draw has the same rules as a regular draw with one difference: The jackpot is raised to £114.5 million, the maximum is set at £167.2 million, a truly colossal jackpot. For more information and ultimate guide about Euromillions superdraw check our a special article focused on this topic. is a supplementary game to Euromillions, using the same numbers and draws as the main game. As opposed to the main game, Hotpicks offers bigger wins for matching a smaller number of numbers. First, you must choose the number of numbers you wish to play with from 1 to 5. To win the main prize you must match all numbers. The winnings are guaranteed. In the case you choose five numbers you can win £1 million. For more details about this supplementary game visit our page dedicated to Euromillions Hotpicks. Euromillions lottery tickets may differ depending on the way you play, either online or via a retailer. Below you will see a model lottery ticket and 5 steps to fill out the ticket. As far as online tickets are concerned, the illustration and the detailed guide are displayed with each recommended online lottery. Use our Euromillions checker to find out if you are last jackpot winner! From the day of draw you have 180 days to claim your prize. You can use several methods depending on the place of buying your ticket. 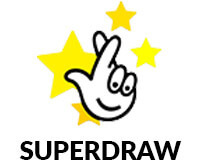 £1 – £500: will be automatically credited to your lottery account. £501 – £30.000 will be sent to your debit card registered to your lottery account First of all, you must confirm this card via a message sent by the organizer to your lottery account. £30.001 – £50.000 will be paid out by check. If you use INKASO it will be sent to your bank account, or when using Pingit your winning will be added to your Pingit account..
£50.000+: Congratulations! Now you should call number 0333 234 44 33 to arrange an appointment to collect your money. £50.000+: Congratulations! Now you should call number 0333 234 44 33 to ask about the conditions for collecting your money. Euromillions lottery portfolio contains syndicate lottery to increase your chances to win. Form a group of people to buy more tickets, wait for the draw and (if you win) share the prize equally and fairly. More information, instructions and manual are available on a special page dedicated to lottery syndicate. As already mentioned, the Euro millions lottery has a total of 13 prize tiers, each with different odds. The smaller the number of identical numbers the bigger your chances to win. More numbers means smaller chances but a bigger jackpot. The odds of winning the minimal prize (for matching just two numbers) are 1 in 22 and the jackpot 1 in 139,838,160. The breakdown of all tiers and the odds are shown in the below table. You can play Europe’s most popular lottery, from the comfort of your home. The easiest way to play online is to visit the website of the National Lottery, the official seller of the Euromillions lottery in the UK. Log in or register and you can start. The play is open each day between 8am and 11pm. Don’t miss the closing time. Mobile users may use their smartphone application to play the lottery for example when waiting at a doctor’s office. For buy Euromillions online you can use unofficial licensed online lotteries. These organisations offer numerous advantages such as discounts, foreign lotteries or free line. To disperse your potential doubts about the credibility of these providers we have tested all of them. The results of the tests including our own experience are described in our reviews. It is only up to you to start betting on Euromillions jackpot. If you prefer keeping a genuine paper ticket in your hand you must go to the nearest shop which is the National Lotter retailer. In the UK, you will get the tickets from special machines, newsstands (tobacconists) or at some selected post offices. You just have to go out to find the nearest retailer enabling lotto. The multinational Euromillions lottery was launched on 7 February 2004 with the first draw taking place on 13 February. Nowadays. Euro lottery is played in 13 European countries. The founding members include: Great Britain, Spain and France. The lottery became so popular that on 8 October 2004 new members joined the three original founders: Belgium, Ireland, Austria, Luxembourg, Portugal and Switzerland. Initially, one line cost £1.50. On 7 November 2009, the price increased to £2. At the same time, the rollover limit was lifted and the maximum jackpot was set at €185 million. Six days later, a game called Millionaire raffle was added in the UK guaranteeing one millionaire in each draw. 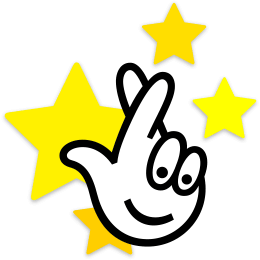 On 10 May 2011 two Lucky Stars draws were added to the total of 11 draws, last tier Lucky Dip and a Tuesday draw. Two months later, on 12 July 2011, the maximum jackpot was raised to the current sum of €190 million (£142 million). Three years later, the supplementary game was renamed into the Millionaire Maker. The most recent of the “D” days was 24 September 2016, on which the price of a line was raised to £2.5 to extend the number of Lucky Star numbers from 11 to 12.